Precipitate Receives Dr. Stewart Re | Precipitate Gold Corp.
Vancouver, B.C. 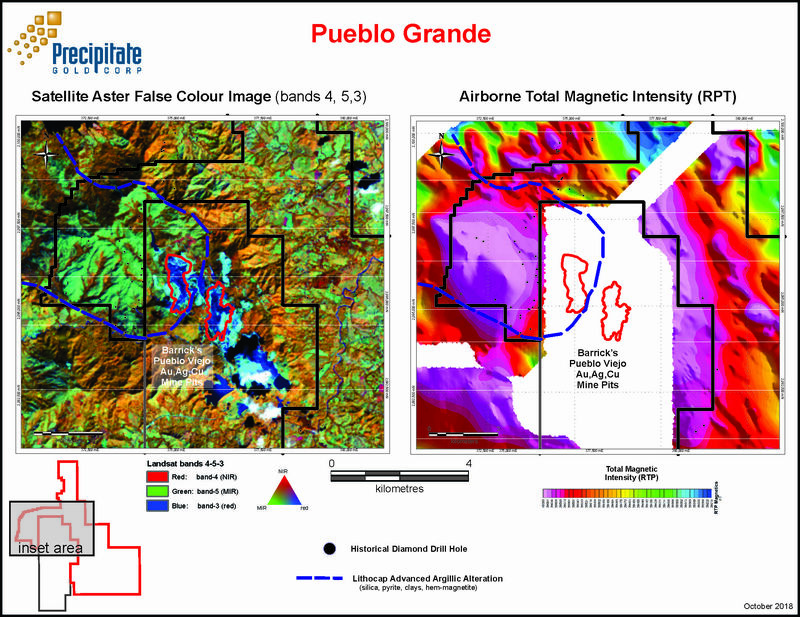 – February 27, 2019 - Precipitate Gold Corp. (the “Company” or “Precipitate”) (TSXV: PRG) is pleased to announce it has received the geological evaluation report and recommendations from independent geological consultant Dr. Stewart Redwood for the Company’s 100% owned Pueblo Grande Project in the Dominican Republic. volcanogenic massive sulphide (VMS) Au-Ag-Cu-Zn mineralization (Tres Bocas Zone) and/or epithermal replacement or veins (La Lechoza Zone). Pueblo Viejo high sulphidation epithermal mineralization is likely of epigenetic origin following a buried porphyry + overlying alteration lithocap deposit model. The lithological contact between the outcropping strongly silicified and advanced argillically altered Hatillo Formation limestone unit (which forms an aquiclude to the mineralizing fluids) and the underlying Los Ranchos Formation volcanic-sedimentary unit (the host rock of gold-silver mineralization) is a conformable one and not a structural unconformity contact as earlier interpretations suggest. Hypothetical schematic section produced by Precipitate Gold (not taken from the Redwood Report). The primary mineralization controls at the Pueblo Viejo deposit are north-south and northwest trending structures. These are also the main structures identified in the lithocap. Exploration should define these structures by geological and structural mapping, lineament analysis and geophysics, and use of geochemistry to look for leakage anomalies. The second control on mineralization is the flat lying, volcaniclastic, chemically reactive sediments of the Pueblo Viejo Member of the Los Ranchos Formation resulting in a stratabound and stratiform control. These sediments are known to occur in parts of the lithocap and should be targeted as a host for concealed, stratabound and stratiform mineralization beneath the silicification and within the lithocap. In the absence of the Pueblo Viejo Member sediments (Los Ranchos Formation), porosity and permeability to host epithermal mineralization can be created in other ways such as structurally-prepared zones with a high fracture density, by breccias, or hydrothermal alteration to vuggy silica, within the Los Ranchos Formation volcanic units. 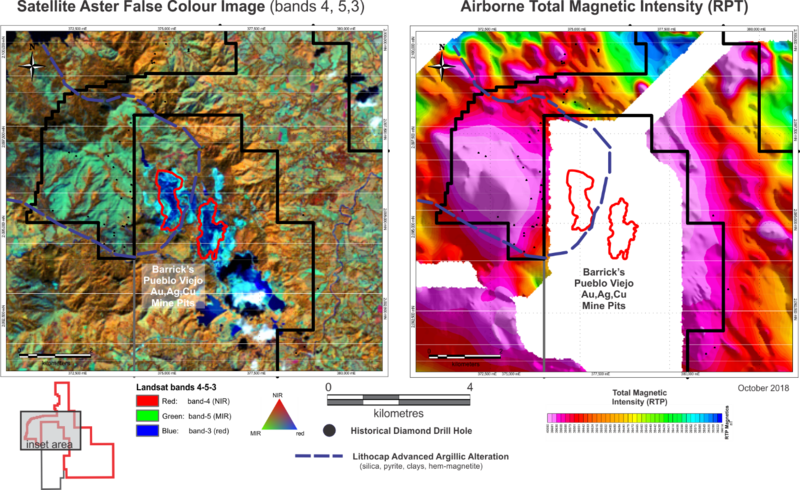 The high pyrite content of the mineralization will respond well to electrical geophysical surveys such as induced polarization (IP) and electromagnetic (EM) geophysical surveys. However, barren pyrite is widespread in the lithocap and underlying volcanic rocks, and thus may limit its usefulness. 3D magnetic modelling will help to define the geometry of bodies of alteration-mineralization in the lithocap and deeper underlying intrusions. Abundant magnetite in the shallow part of the lithocap gives a strong magnetic high. The advanced argillic alteration is magnetite-destructive and will give a magnetic low. Airborne hyperspectral imaging could be used to map alteration in the lithocap and look for “hot-spot” targets. Short-wave infrared (SWIR) core scanning such as Corescan or TerraCore is recommended to log alteration in drill core. The Hatillo Formation limestones underwent massive silicification with veins and pods of massive hematitized magnetite at the contact with the underlying Los Ranchos Formation. For more Pueblo Viejo deposit model technical information review the 2006 Economic Geology article (v.101, p 1427-1435), titled ‘Pueblo Viejo High Sulphidation Epithermal Gold-Silver Deposit, Dominican Republic: A New Model of Formation Beneath Barren Limestone Cover’, co-authored by Dr. R. Sillitoe, David Hall, Dr. Redwood and Precipitate Director, Alistair Waddell. In the early 2000’s Dr. Redwood served as the first President & CEO of GoldQuest Mining, where he worked extensively exploring and evaluating multiple projects throughout the Dominican Republic. Dr. Redwood is a renowned economic geologist, having worked for numerous mining and exploration companies in over 35 countries around the world, with a specific focus and expertise within Latin America. During his 30+ year career, Dr. Redwood has authored multiple technical reports and published papers in Economic Geology and other journals and has authored (or co-authored) several technical reports and publications on Dominican Republic geology and ore bodies, including the Pueblo Viejo gold deposit located immediately adjacent to Precipitate’s new Pueblo Grande Project in central Dominican Republic. Full details of Dr. Redwood’s credentials, work history and publications can be found on his website at sredwood.com. Precipitate Gold Corp. is a mineral exploration company focused on exploring and advancing its two district scale landholdings in the Dominican Republic’s two most significant mining and exploration camps, specifically its flagship Pueblo Grande Project immediately adjacent to Barrick’s world-class Pueblo Viejo mine operation, and its Juan de Herrera Project adjacent to GoldQuest’s Romero Project. The Company also maintains assets in southeast Yukon Territory, specifically the Company’s Reef property located immediately adjacent to Golden Predator’s 3 Aces Project in the Upper Hyland River area. The Company has entered into an Option to Purchase Agreement with Golden Predator whereby Golden Predator can earn a 100% interest in the Reef claims by making certain staged payments in cash and shares and warrants. Precipitate is also actively evaluating additional high-impact property acquisitions with the potential to expand the Company's portfolio and increase shareholder value.